T.m. moluccanus: Both adults strong purple/blue streaking on entire head; yellow/orange breast with barring minimal or absent; collar yellow/green; deep purple/blue abdomen. T.m. septentrionalis: Both adults as in moluccanus, but purple/blue streaking on head brighter; shorter tail. Repeated notes, sharp, rolling while in flight. Shrill chattering while feeding. Soft notes at rest. 20 years in the wild, 15-25 years captivity. Enclosure with drain in floor, or suspended cage over tiled or concrete floor. Nectar - a commercial type specially formulated for small species or a mix of baby cereal (lactose-free) and honey, malt extract or molasses, mixed with filtered water, made fresh once or twice daily, making up at least 40 percent of the diet; vegetables and fruit especially apple, pear, orange, cactus fruits and bananas, and one or more daily of: carrot, fresh corn, green leaves; plus dried figs soaked in water for a few hours, spray millet and a small amount of soaked or sprouted sunflower seed and small amount of canary seed. Loves bathing, hanging toys, puzzle/foraging toys, foot toys, ladders, swings, socializing; noisy toys (bells, squeakers), bird safe chewables (vegetable tanned leather, safe woods). L-shaped box, 51cm x 36cm (20 x 14 in). Population is in decline due to heavy international trade. T.m. moluccanus: Occurs in SE and E Australia from Gulf of Carpentaria and S Cape York Peninsula, N Queensland, south to S Victoria and SE South Australia, including Kangaroo Island; also Tasmania and introduced to Perth district, SW Australia. T.m. septentrionalis: Found N Queensland, on islands in Torres Strait, excluding Boigu and Saibai; also Cape York Peninsula south to Endeavour and Daintree Rivers. Most common in lowlands but found up to 2400m (7872 ft). Wide variety of areas including settlements, forest, coconut plantations, savanna, Eucalypt stands and mangroves. Feeds mainly on nectar but will also take figs, insects and can be found around man-made feeding stations. 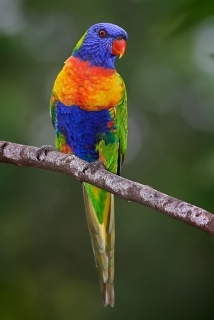 Found in mixed flocks with other parrots; in small noisy groups. Nomadic, as they are dependent on flowering trees. Roosts communally in groups of hundreds of birds. Will also roost and nest on the ground on some of the predator-free islands. Displays frequently. 2 to 3 ovate eggs, 27.0 x 22.5mm (1 x 0.9 in). Season Aug–Jan in SE Australia, may be almost year-round in Queensland.